My school librarian is hosting a Lunar New Year Tea on January 31st. This annual event is an opportunity to share Asian culture with the school staff and also to highlight new library books and resources. The library also started a small makerspace this year so I wanted to 3D print a decoration to contribute to the event. 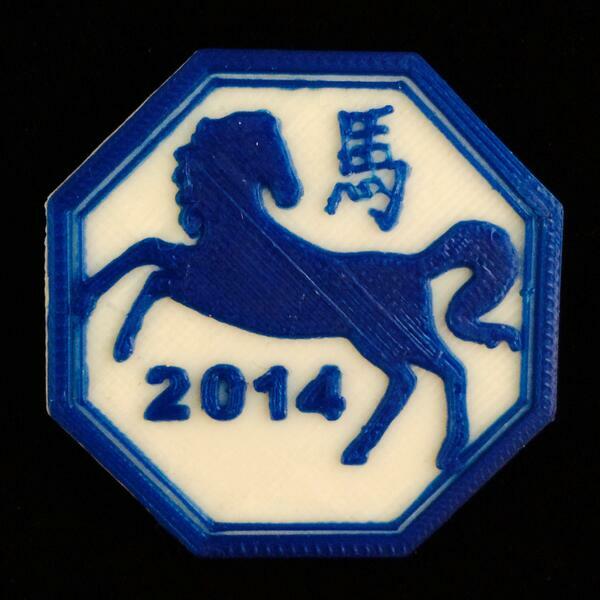 2014 is the Year of the Horse on the Chinese Zodiac. I did a search for an existing 3D model to print and wasn’t able to find anything relevant. Like my quest to print Martin Luther King, Jr. for MLK day, I was surprised at the lack of designs. 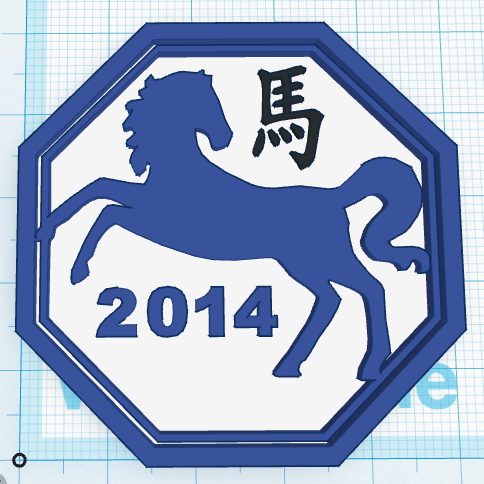 I decided to design my own Year of the Horse Medallion. I did a Google Image Search using the keywords Chinese Character for Horse. A lot of great images were returned but many of them were commercial stock photos that would cost money to use. I wanted to publish my design so needed images that allowed reuse. Luckily Google includes a filter for usage rights. Search Tools –> Usage Rights –>Labeled for Reuse. The following image was the first hit and was perfect for what I needed. Even better, the file was an .svg filetype which is a 2D vector image format that can be imported directly into 3D design program Tinkercad. I created a new design in Tinkercad and then clicked Import–>URL and copied and pasted the image URL into the box. (http://upload.wikimedia.org/wikipedia/commons/7/76/Horse.svg) I selected Scale 10% and Height 2mm. I then found an .svg file of the Chinese character for horse and imported that into the design using the same steps. I added the numbers 2014 from the built-in Tinkercad characters. I moved and resized the components making sure the height ended up at 2mm to complete the design. The design needed a back so the pieces would stay together. I could have used a few 1mm high rectangles to create the back but instead opened the original .svg drawing in a vector editing program. I used iDraw but Inkscape is a free and open source alternative. I selected all the point in the interior of the image and deleted them leaving just the outside octagonal shape. I exported the .svg of octagon and imported into the Tinkercad design. After aligning and grouping my design was ready for downloading and printing. The design requires a filament swap after printing the 1mm high base of the medallion. I normally print at a 0.2mm layer height so need to change the filament after the 5th layer. Printing with Repetier-Host and a Printrbot, I manually pause the print and move the extruder up and then home the X axis. I swap the filament and then extrude filament until the color changes. I then home the X and Y axis then resume the print. I have posted this design to Thingiverse and challenge others to post designs related to history, culture and current events for educators to print and use in the classroom. Happy New Year. ← 3D Printing Martin Luther King, Jr.